Welcome to day 3 of my huge blogaversary giveaway to celebrate My Mummy Spam turning 1 year old! 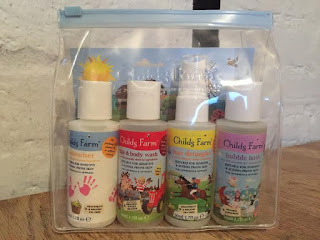 Today I am giving away a travel set from the wonderful Childs Farm! One of the first reviews I ever did on this blog was of a Childs Farm shampoo and conditioner and I am so excited to now be giving away a few of their products for one lucky reader to try. Childs Farm is an awarding winning British brand that uses natural 'free from' ingredients and essential oils to produce mild, kind and extremely yummy smelling toiletries that care for the skin and hair of newborns, toddlers and children. I have always been a huge advocate of this brand as it was one of the only things we could use on bubba when he was little as his skin was so sensitive but now I am also an ambassador for them too!! To be in with a chance to win this lovely little set, just click on the link below and follow the instructions! To check out the full range from Childs Farm, click here! 2. Winner will be notified via Twitter or by email if Twitter handle isn't provided. 3. Winner must respond within 7 days or another winner will be drawn. 5. My Mummy Spam takes no responsibility for any goods damaged or lost during shipping. 6. This offer has been provided to me by Childs Farm but all opinions expressed are honest and my own. My son loves squirty foam bubble bath! For myself, Bodyshop. For Lily its Childs Farm or Infacare. A wind up toy - my daughter loves following it around the bath! anything from Lush is my favourite, Lu isn't picky -sometimes I just use water as her skin is delicate.